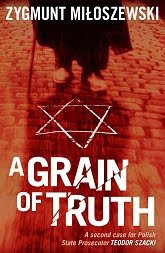 A Grain of Truth, Zygmunt Miloszewski's second crime novel featuring Polish prosecutor Teodore Szacki (published by Bitter Lemon and translated by Antonia Lloyd-Jones), is, like the first book in the series (Entanglement) a satisfying combination of police procedural and mystery novel, with considerable humor and social commentary added in. Szacki has left Warsaw for the small city of Sandomierz, seduced by its beauty but now regretting his separation from Warsaw's urbane pleasures as well as his ex-wife and estranged daughter. But he finally gets a good murder to sink his teeth into: a well-known woman, wife of a town councillor and herself a promoter of educational theater, is found with her throat slashed just outside a former synagogue (now a state archive). Near the body is found a kind of knife used by kosher butchers, raising the long and continuing history of Polish anti-semitism as well as the country's new liberalism (what if the murderer is in fact Jewish?). The development of the story and the investigation of the crime develop slowly at first, ultimately shifting into underground tunnels, attack dogs, and multiple murders that veer toward the Gothic and the conspiratorial excesses of Dan Brown (who is mentioned) but ultimately Miloszewski succeeds in accessing the energies of those genres within a contemporary realism that is convincing and satisfying. Plus there's ultimately a twist that will satisfy the fans of the puzzle mystery. There are profuse references to popular culture, mostly from outside Poland, though there are many references to a Polish TV mystery series filmed in Sandomierz, Father Mateusz, which seems to be a remake of the long-running Italian series, Don Matteo (complete with bicycle and gentle non-threatening plotting. Mateusz provides a contrast for the grittier reality of Szacki's life. While Miloszewski explores anti-semitism and its history in depth, he leaves unexamined a flaw in his own character that keeps him human but also may irritate some readers. His language, especially in his interior monologues, can be unpleasantly sexist. But he genuinely regrets the actions on his part that destroyed his marriage, and his almost painfully comic blunders with his current love life provide evidence that the author is an intentional character flaw rather than unconscious prejudice (though the flaw may temper a reader's sympathy for Szacki's difficulties with the women in his life). Both of Miloszewski's novels are complex, involving, and interesting, but A Grain of Truth is more satisfying as a crime story than Entanglement, and the use of history, conspiracy, and the extended range of crime fiction are livelier. Entanglement relies more on the locked-room mystery and the gathering of suspects together in a room, both being longstanding elements of the genre, but tending toward static rather than dynamic plotting. A Grain of Truth shifts toward the dynamic side of crime writing, though still with considerable care in development and careful attention to the voices of all the characters, including the difficult but engaging prosecutor himself.